In this tutorial we’ll take a look at the BGP Confederation. As you might know, IBGP requires a full mesh of peerings which can become an administrative nightmare. If you don’t know why we need a full mesh, I recommend to start reading my IBGP tutorial first. 6 * (6-1 = 5) / 2 = 15 IBGP peerings. By dividing our main AS into two sub-ASes we reduced the number of IBGP peerings from 15 to 8. Within the sub-AS we still have the full-mesh IBGP requirement. Between sub-ASes it’s just like EBGP, it’s up to you how many peerings you want. The outside world will never see your sub-AS numbers, they will only see the main AS number. Since the sub-AS numbers are not seen outside of your network you will often see private AS numbers used for the sub-ASes (64512 – 65535) but you can pick any number you like. Above we have AS 2 which is divided into two sub-ASes, AS 24 and AS 35. There’s also AS 1 on top that we can use to see how the outside world sees our confederation. Let’s look at the configuration shall we? Just like any other IBGP configuration it’s best practice to use loopback interfaces for the BGP sesssions. For this reason I created a loopback interface on all routers within AS 2 and I’ll use OSPF to advertise them. The configuration of R2 requires some explanation. First of all, when you start the BGP process you have to use the AS number of the sub-AS. 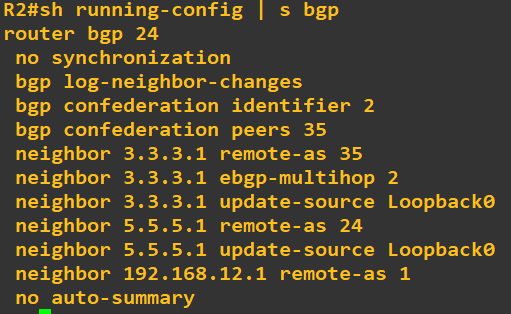 Secondly, you have to use the bgp confederation identifier command to tell BGP what the main AS number is. We also have to configure all other sub-AS numbers with the bgp confederation peers command, in this case that’s only AS 35. R4 is in the same sub-as so you can configure this neighbor just like any other IBGP neighbor. R3 is a bit different though…since it’s in another sub-AS we have to use the same rules as EBGP, that means configuring multihop if you are using loopbacks. The configuration of R3 is similar to R2. We configure it to use AS 35 while the main AS is 2. Our only sub-AS peer is 24 and we have two neighbors…one IBGP neighbor and one “EBGP” (confederation BGP) neighbor. You have to configure this on all routers within the sub-AS otherwise they won’t consider themselves part of the confederation. They will be able to establish BGP peerings but they’ll consider other routers in the confederation as regular “external” or “internal” neighbors. They will also drop routes when they see a confederation path in it. I guess you could make that work, R5 would probably see R2 as a regular iBGP neighbor that advertises an external route (from R1). The question is, why would you want this? As soon as they do learn something with a sub-as path then they’ll refuse the route. Better to just add the confederation identifier (and peers) to all devices in the confederation. When R1 advertises route to R2 that’s external and learned via ebgp. For ibgp protocol states that next hop advertised by ebgp should be carried into ibgp. So when R1 advertises 11.11.11.11 to R2 it uses next hop address as 192.168.12.1. So when R2 advertises this route to its ibgp peers it should have next hop as 192.168.12.1 and not as 2.2.2.2 . Is this case we can also use next-hop-self command ? or using igp like ospf is the only option? Can you tell me if in GNS we have any kind of incompatibility with Confederations. I did a lab on the GNS3 Cisco Router 7200, when I set up EBGP between R1 x R2 look at the messages.